As expected, Intel's Ronler Acres campus in Hillsboro is about to get bigger. Already the largest Intel campus in the world, Intel is planning a major expansion of its D1X manufacturing facility near Northeast Butler Street, bringing years of construction to the area. The state's largest private employer has been teasing a major expansion of its Hillsboro campuses for months. The company announced in December it was considering a years-long, multi-billion dollar project at one of its Hillsboro campuses, but didn't say which one. Just what the expansions might look like in Oregon has been unclear, but Intel officials met with about 50 neighbors around Intel's Ronler Acres campus in a closed-door meeting on Monday, Feb. 4, to discuss the expansion and its impact on local neighborhoods. Ronler Acres' massive D1X manufacturing plant will be getting bigger, according to people with details of the meeting. The first two stages of the plant were finished in 2013 and 2015. Both took years to build. A third expansion of the D1X facility of about the same size is expected to break ground later this year. Intel also plans to build a "multipurpose technical facility" on Ronler Acres' northwest corner, near Dawson Creek Drive, as well as a six-story parking garage. Intel expects the facilities to fit within the existing campus, and Intel isn't expected to need additional permits for additional air quality. Intel operates four large campuses in the Hillsboro area. Ronler Acres is widely seen to be one of the most advanced research manufacturing facilities in the world. Each new generation of the company's microprocessors is created there, then mass-produced at other facilities across the globe. Construction is expected to begin sometime this year, and will take several years to complete. The expansions aren't a surprise. Plans for the third phase of D1X have been known for years. The company's master plans have called for an additional expansion of the facility since at least 2015. And neighbors in the area are used to construction. D1X first broke ground in 2010. At the time, it was the largest capital project in Oregon history. But Intel officials have said they plan to work more closely with area neighbors than they have in previous construction projects on the campus. The company plans to host several community meetings over the course of the construction. To minimize the impact of construction and noise, dump trucks will not use Butler Street, instead relying on internal roads on the Intel campus out to Evergreen Parkway or Century Boulevard. Intel says it will add a wall around the Dawson Creek Drive construction site to help reduce noise. Intel has long been known for its work with PCs, but the company has expanded its reach to include just about everything, in what has come to be known as the Internet of Things, connecting everything from refrigerators to cars. "Intel is not just the CPU inside your personal computer," Ann Kelleher, Intel's senior vice president and general manager of manufacturing and operations wrote on the company's website in December. "We are the safety features in your car, the wireless connection in your phone, the intelligence in the cloud and more. Intel's ability to optimize and apply our manufacturing expertise to deliver more advanced, differentiated products is foundational to our current and future success." The expansion in Hillsboro — as well as other site expansions underway at manufacturing sites in Israel and Ireland — are expected to help the company respond to changes in the marketplace, Kelleher said. "With the biggest market opportunity in Intel's history ahead of us, we will take the necessary steps to prepare our global manufacturing network for flexibility and responsiveness to changes in demand," Kelleher said on Feb. 5. Intel officials haven't disclosed how many people will be needed to run the new facilities when completed. 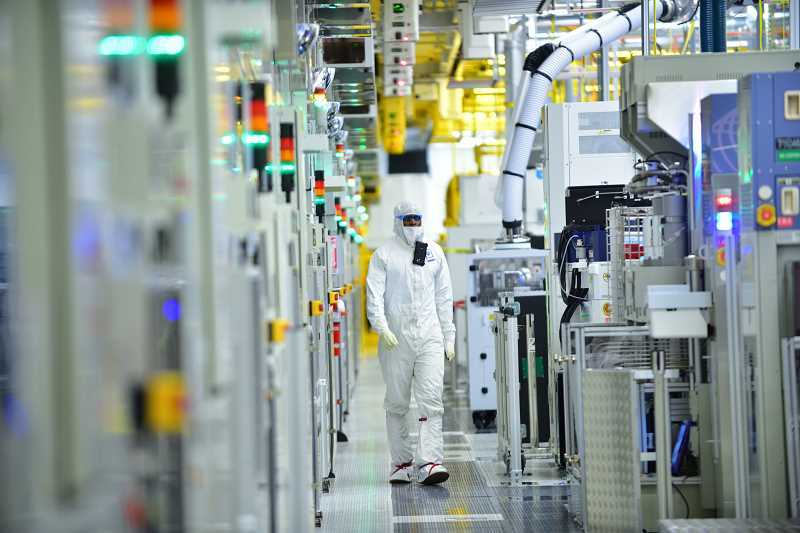 Intel already employs about 20,000 people in Hillsboro.